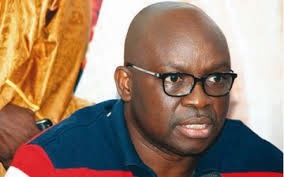 The Ekiti State Governor, Ayodele Fayose, has defended his call for the dissolution of the National Working Committee of the Peoples Democratic Party, saying he has evidence the party’s national chairman, Adamu Mu’azu, helped the opposition win recent elections. “In saner climes, when a war commander leads his troops to an embarrassing defeat, such commander does not need anyone to tell him that he needs to leave the war front for another commander to take over,” Mr. Fayose said Tuesday in a release issued by his spokesperson, Lere Olayinka. While describing the attack on his person by the NWC as unfortunate, the governor said it was sad that the NWC members, especially the national chairman, were refusing to allow new people to manage the party after managing it to its first national electoral failure. “How do we explain the PDP losing so scandalously in Bauchi State, despite the presence of the national chairman, federal capital territory minister and the state governor?” he asked. “I am even more particular about the National Chairman because he sold the party to the opposition. I have cogent evidences of his unholy alliance with the opposition before the elections and if they go any further, I will expose all his underhand deals. Mr. Fayose said his call for the dissolution of the Adamu Mu’azu-led National Working Committee, NWC, of the Peoples Democratic Party, PDP, was in good faith, and in the overall interest of the party. ​ ​”I have no apology on my position on the NWC because their responsibility as a party does not take away their failure in the last general elections,” he said. Mr. Fayose last weekend called a meeting of the South West zonal PDP caucus in Ado Ekiti, where two officials in the NWC from the zone were asked to resign their positions. The National Secretary, Wale Oladipo, had issued a statement saying he would not resign because the failure of the PDP in the last election was not the fault of the NWC as they were side-lined. The PDP spokesperson, Olisa Metuh, on Monday berated Mr. Fayose for leading the call for the sack of the NWC despite being one of its biggest beneficiary. Mr. Metuh said the NWC stood by Mr. Fayose to ensure that a transparent primary was held in Ekiti in 2014 because it believed he had the support of the people. Mr. Metuh also said the NWC even donated N30 million to Mr. Fayose’s campaign and that N100 million was shared to all states during the governorship election that held on April 11. Mr. Fayose however denied receiving such money during the elections. He challenged the NWC to provide evidence. Mr. Fayose said he was committed to the PDP. He said would continue to defend the party even as the last member remaining.